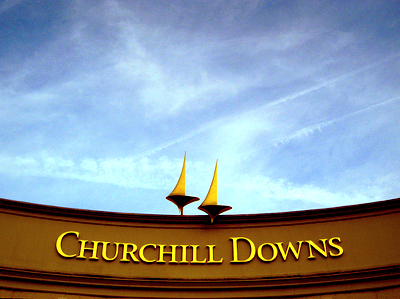 The main track at Churchill Downs, which hosts a record eighth Breeders’ Cup Nov. 4-5, is different from any dirt surface in the nation. Most tracks are comprised of limestone with dirt on top. The Louisville venue has no such base while the track is mixed with a deep layer of soil, clay and organic materials several feet underneath. However, even the composition of dirt surfaces vary. Calder Race Course’s main track is a 12-inch base of sand and clay with a 4 ½-inch cushion comprised of sand and clay. The track becomes a bit cuppy while drying out from rain. At Monmouth Park, where the 24th Breeders’ Cup was staged, a good rain results in a dead rail for a day or so. Churchill Downs is much different up to 24 hours following a rainstorm. However, it arguably becomes the best strip in racing because the main track turns faster compared to its dry, unusually deep surface that many horses plainly don’t like. Rainfall in Louisville is evenly distributed throughout the year, but the wettest month is May when the first leg of the Triple Crown is staged. In 2009, the winner of the 136th Kentucky Derby wasn’t that far back when the track came up sloppy and was sealed. Super Saver was fourth within easy striking distance of the pacesetting Conveyance after six furlongs of the 1 ¼ miles while saving ground on the inside. The son of Maria’s Mon advanced to second with a quarter-mile left, took command in the stretch and drew away to score by 2 ½ lengths. Closers didn’t have many good afternoons during the past spring-summer meeting at Churchill Downs while speed did well in sprints. During the 2011 meeting from April 30 to July 3, according to Brisnet.com, 33 percent of the 78 winners at six furlongs led at every call. In 59 races at 1 1/16 miles, 15 percent of the winners went wire to wire. Going back to last year’s BC event, Big Drama sprinted clear from the start of the Sprint, led by a length after a half-mile and won by 1 ½ lengths under steady urging. The son of Montbrook, who covered the six furlongs on a fast track in 1:09, will defend his title on Nov. 5. The challengers include runner-up Hamazing Destiny, whose recent form hasn’t been good, failing to win in four outings this year. The son of Salt Lake ran second and fourth to Jackson Bend, a likely starter. Winners of last year’s Juvenile and Juvenile Fillies were no farther back than 1 ½ lengths after a half-mile. Uncle Mo disposed of two runners as he entered the stretch and drew off under steady urging to win by 4 ¼ lengths covering the 8 ½ furlongs in 1:42 3/5. Awesome Feather, only a head back in the stretch, scored by 2 ¼ lengths in a hand ride covering the 1 1/16 miles in 1:45. The unbeaten daughter of Awesome of Course will skip the Ladies’ Classic because she has only raced once this year. Meanwhile, Uncle Mo has been pre-entered in the Dirt Mile and Classic.